You can say you have proved a connection via paperwork and sources and most all of us know how to post a citation for that proof. But what do you do when you finally prove your paper trail (or lack thereof) of sources? How do you post a DNA confirmation citation? I got a kick in the bum (completely unintentionally) from one of my heros, DNA expert extraordinaire, Peter Roberts. I was doing the things I do on Wikitree (where I post all of my ongoing – it never ends does it? – research) and noticed Peter working with a profile and DNA triangulation. As a part of what he had done we had a short email exchange about DNA confirmation and why it’s important to cite the DNA confirmation in the child’s information. The kick in the bum made me go back and figure out how to add my DNA citations! 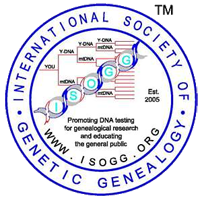 So for example, my grandmother’s DNA has been proven using a method called triangulation (basically I have found two other people who match my DNA, through testing, our segments match location on the same chromosome and our genealogical research sync’s-up as well). I am using atDNA (autosomal) with 4th cousins. But how on earth do I cite this? I went to the DNA Confirmation Help Page on WikiTree and looked it up! Next Next post: What is the story?